Get extreme speeds for fast transfer, app performance, and 4K UHD2 for your AndroidTM-based smartphone, and action cams and drones. 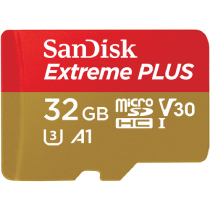 SanDisk Extreme® PLUS microSDHCTM and microSDXCTM UHS-I Cards are shockproof, temperature-proof, waterproof, and X-ray-proof,4 so you can enjoy your adventures without worrying about the durability of your memory card. * Up to 100MB/s read speeds; up to 90MB/s write speeds. Based on internal testing; performance may be lower depending upon host device interface, usage conditions and other factors. 5 UHS Speed Class 3 (U3) designates a performance option designed to support real-time video recording with UHS-enabled host devices. Video Speed Class 30 (V30), sustained video capture rate of 30MB/s, designates a performance option designed to support real-time video recording with UHS- enabled host devices. See www.sdcard.org/consumers/speed. 7 A1 performance is 1500 read IOPS, 500 write IOPS. Results may vary based on host device, app type and other factors.